ARLINGTON, Tenn. – Boy Scout Troop 452 of Arlington UMC has been writing and sending personal notes, calling cards, and care packages to Marine units in Afghanistan. Jake Romo, 22, one of the Marines receiving care packages, was on a Feb. 11 patrol when he stepped on a pressure-triggered IED. 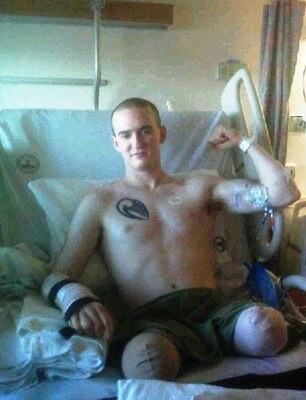 The explosion broke his right hand and took both his legs in an instant. A corpsman pulled Romo from the crater and he was evacuated by a helicopter to a nearby hospital. Twelve surgeries later, he was transferred from a Bethesda (Md.) Naval Hospital to Naval Hospital Camp Pendleton in California where he was stationed prior to his deployment to Afghanistan. There he will continue his recovery and await the birth of his second child in May before returning to his home in Tennessee. Teresa Rector, program coordinator for Collierville UMC and chaplain of Troop 452, says volunteers have already stepped forward to build a handicap ramp and widen the doorways of Romo’s Germantown, Tenn., home. She says Jake’s stepdad, Stephen, gave her Support-Our-Troops bracelets for the troop. She gave Stephen a copy of Strength for Service to God and Country to give to Jake. Jake Romo prepares for a medflight from the Bethesda (Md.) Naval Hospital to Naval Hospital Camp Pendleton where he was stationed before deploying to Afghanistan.